Last July, my mother took a bad fall from the top of the staircase. She spent her birthday in the hospital. Luckily no bones were broken, but she had severe cuts and bruises and her dementia worsened significantly. Mom had to give up her license and her home. This has been an emotional ride for the whole family. Thankfully, mom doesn’t need to be alone through this, she has children and grandchildren and great grandchildren who love her dearly. Mom is living with my sister and brother-in-law who have made her feel welcome and needed. She spends many hours a week watching a digital picture frame of photos from her past and retelling those memories to everyone who stops in for a visit. In cleaning out her house, I passed heirlooms on to the family. One thing I kept for myself was her set of knitting needles. There are many things mom can’t do anymore, but knitting is something she can do. And teaching me to knit is one of her new tasks. In September, I was thrilled to meet funny man and Caledecott Award winner, Dan Santat. I was moved to tears hearing the back story behind his newest picture book, which he authorstrated. In addition to getting my copy signed by the legendary surly asian guy, I also got a beautiful tote bag. That bag has become my knitting bag. I’m proud and happy to have a reminder that mom can still teach me something new literally ‘after the fall’. Like Humpty Dumpty, mom was able to pick herself back up (with lots of help and support) and move forward in her life. She is an inspiration to me and I know I’ll never read this story without thinking about her. AFTER THE FALL written and illustrated by Dan Santat (Roaring Brook Press, 2017) That famous egg Humpty Dumpty takes the famous fall. But what happens when all the king’s horses and all the king’s men put him back together again? He’s patched up but not quite the same. Not only can’t he climb back up the wall to sit and do his favorite thing, bird watching, he can’t even climb up to the top bunk and ends up sleeping on the floor. The wall haunts him. Now even bird watching mocks him. He faces the wall every day. And little by little he works up the courage to climb back up. What happens when he does? Humpty Dumpty cracks again… and he flies away. Humpty Dumpty is the most beautiful bird in the sky. So fast forward to today, two days before Thanksgiving and I count my blessings, always counting my family first. With mom’s help I have knit four scarves and one baby blanket to give my grandchildren for Thanksgiving. Today was such a gorgeous sunny day, I took pictures of everything outside to show off the rich colors. If you look closely, you’ll see all the imperfections. But I hope you also see the love. The first two scarves have the most mistakes. Each one was ‘ripped’ and restarted more than once. There were a lot of dropped stitches and uneven edges. But I eventually mastered the simple garter stitch, casting on, binding off, and adding a new skein of yarn to a working project. I finished them both off with pom-poms using up the leftover yarn and adding a bit of both colors mixed with white so each granddaughter would have a piece of her cousin’s scarf in her own. The next two multicolored pastel scarves are for the two older granddaughters’ younger sisters. The yarn was dyed like this and I bought a giant skein so I didn’t even have to add another ball to finish each one. By now, I was able to whip these up in a couple of days. Then the big challenge came. I learned to combine the knit stitch with the purl stitch and a slip stitch and followed a simple herring bone pattern using two different balls of yarn at the same time to make a car seat/stroller blanket for my youngest grandchild and first grandson… the little prince. Wow, after the scarves I thought I was up for something different. This was a little more than I had bargained for. Not only was I losing track of the pattern, I had trouble keeping my tension even, so one end of the blanket is much wider than the other end. The scarves and blanket are ready to give my precious grandchildren. They’re not perfect, but then neither am I . So when my little ones are wrapped up in soft colorful yarn, they’re also wrapped up in my love. And because I am who I am, no gift is complete without a book. No, no one got my signed copy of AFTER THE FALL. But I did find three books featuring knitting to give each family. Sadly, I mailed off the baby blanket this morning without a book picture, but you get the idea. EXTRA YARN written by Mac Barnett and illustrated by Jon Klassen (Balzer and Bray, 2012) In a black and white world Annabelle finds a box of colorful yarn. After knitting a sweater for herself, she uses some of the extra yarn to knit a sweater for her dog, then her neighbor, and his dog, and her classmates, and her teacher but she still had extra yarn. It seems that tiny box had an endless supply of colorful yarn, so Annabelle knits sweaters for her mom and dad, and all the people (except Mr. Crabtree), and all the animals in her neighborhood. Then she goes around the world knitting and spreading bright colors over the otherwise drab scenery. An evil archduke offers Annabelle a million dollars for her box of yarn but she refuses to sell it, so he sends robbers into her room to steal the box. Unfortunately, when he gets the box it is empty. He curses her and throws the box out the window. The box finds its way back to Annabelle who still had enough extra yarn to knit a sweater for her tree. LOST. FOUND written by Marsha Diane Arnold and illustrated by Matthew Cordell (Roaring Brook Press, 2015) Bear loses his long red scarf in the woods. It is alternately found and then repeatedly lost again by each animal who finds it. Eventually they all find it again in a clearing and in a struggle to claim the scarf for themselves they destroy it. But Bear has an idea, taking up all the loose yarn he teaches the forest animals to knit one extra long scarf that they all share around a campfire. PENGUIN AND PINECONE written and illustrated by Salina Yoon (Bloomsbury, 2012) Penguin loves his new friend Pinecone and thinking he might be cold, Penguin knits him a scarf to match his own. Pinecone is still cold, so Penguin does the hardest thing… he helps him return home to the pine tree forest and leaves him in a pine nest to keep him warm. When Penguin returns he finds his friend has grown into something even greater. Another great picture book is KNIT TOGETHER written and illustrated by Angela Dominguez (Dial Books, 2015). I wrote a post about it a few years ago. Follow this link for a quick review and some fun yarn activities you can do with your little ones too. There’s more fun with LOST. FOUND and PENGUIN AND PINECONE on these pages. The three Polar Bears were getting their home ready for Christmas. They decorated the tree, hung the stockings, and cooked a huge Christmas pudding. But when they sat down to eat, they found the pudding was too hot, so the three bears decided to go for a walk while it cooled down. While they were gone, Santa had just landed on the roof the the three bears’ house. Santa saw the beautiful decorations and smelled the wonderful pudding on the table. Thinking the pudding had been left for him, he began to eat… Papa Bear’s pudding was too hot, Mama Bear’s pudding was too cold, but Baby Bear’s pudding was just right, so he ate it all up. Then Santa proceeded to sit in the bears’ chairs… one too hard, one too soft, one just right. But like the story goes, Santa bounced a little too much in Baby Bear’s chair and it broke, landing Santa on the floor. So of course, Santa moves into the Bears’ bedroom and tries out all the beds… too high, too low, just right. And Santa falls asleep in Baby Bear’s bed. When the bears returned home, they grumbled and growled, ‘Somebody has been eating my pudding!’ ‘Somebody has been sitting in my chair!’ and finally ‘Somebody has been sleeping in my bed!’. All the commotion woke Santa up. 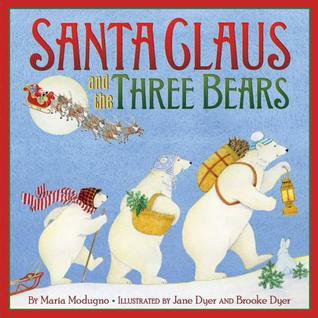 He made the bears promise that they wouldn’t tell anyone they had seen him and gave them each a bright red present to open in the morning, and he jumped in his sleigh and took off. Maria Modugno did a nice job of retelling a favorite fairy tale with a little Christmas twist. And the illustrations are splendid. Jane and Brooke Dyer gave just enough detail in their artwork to resemble the traditional three bears story with a fun little twist at the end, when Papa Bear gets the little wee present, Mama Bear gets the medium sized present, and Baby Bear gets the great big present. This was a fun story to read. And, whether or not children are familiar with the traditional tale, this is one I’m sure they will enjoy reading and hearing over and over.